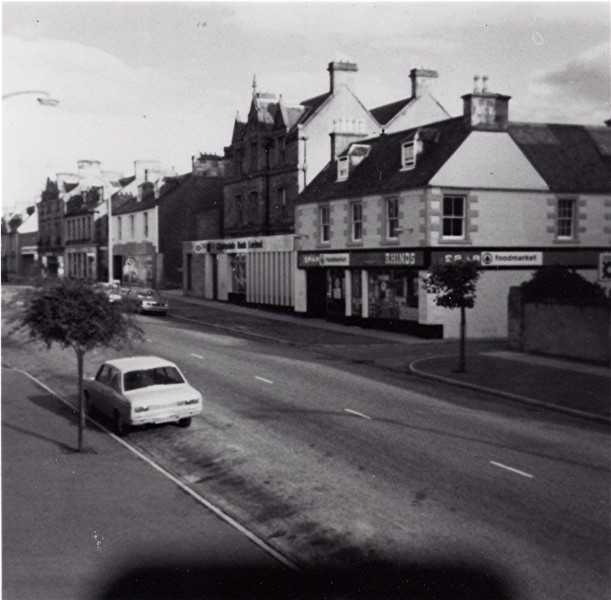 A rather blurred picture of the High Street with Rhind's shop in what is now the Highland Council Service Point, next to Clydesdale Bank. Photo probably taken in 1970s. You are right Harry, I think its official title was the Alexandra Warehouse or house. There were groceries downstairs and drapery upstairs. They also had a van that sold goods at the houses. JE Macdonalds was known as the Glasgow Warehouse (now looking rather sad & dilapidated). Where Boyd"s used to be on the north corner of King St, there used to be an upstairs apartment occupied by some elderly ladies, one of whom always wore a sort of round hat. She was known locally as "the wifey in the bowler hat". There was also a pear tree in the back that hung over the iron gate that had the best pears in town.....anyone else recall those ladies? - or the pear tree? Harry - I remember one old lady that lived above Boyd's - her name was Lotte I think - always wore black lacey veils on her hats - she lived to a very old age. By the way, I am the youngest son of Naxie as mentioned in your first comment on this picture - I too did the message bike thing as a youngster - some machine as you say, up the hill to Gordon Terrace against the wind with a full load and one gear was some task - grand going back though! I remember making up the tatties into 1 stone bags but must have ben excused duty on the tea chests ! Vividly remember the shop and others like it in the town - smells of fresh bacon and cheeses, nothing in wrappers and we seemed to have survived it. The smell of the freshly ground coffee in Boyds was like stepping into another world at the time. The drapers was at the front of the building - not upstairs, the grocers was at the side - we lived upstairs . Liz(Askew) - Can you settle a query - "What was the Viewfirth called when your family lived there before it became the hotel?" Hi Graham - it was always known as the Viewfirth (no "the") when my gran had it. She also owned the field next door between her and St Ninians for the last few years that she had the Viewfirth. It now has a bungalow on it. I know you of course, but I also seem to remember you as a lifeguard at the pool one summer? I worked in Boyds one summer and only John used the coffee grinder - the aroma was out of this world. You could also get things like Ayrshire middle cut at No 3, no plastic watery bacon then!